Mordialloc, a bayside residential suburb, is 25 km south-east of central Melbourne. 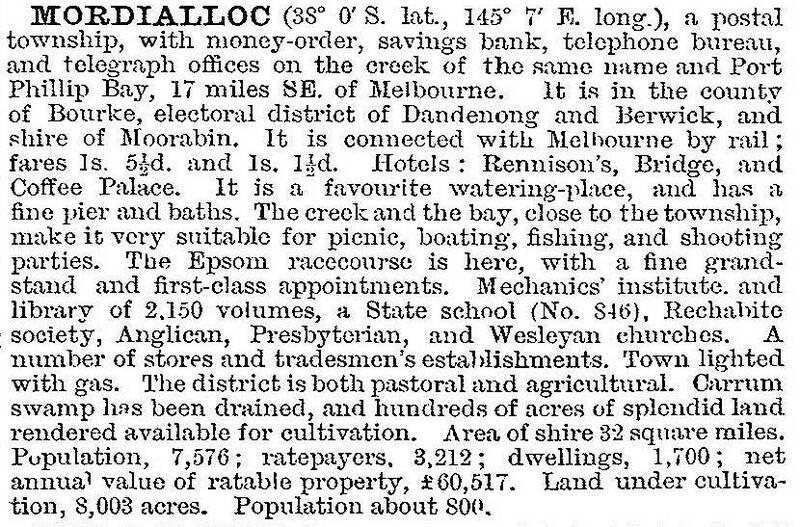 The name's antecedents are a squatting run ‘Moodi Yallo’ (1837), a census taken in 1841 at ‘Moode Yallock’ and Georgiana McCrae's visit to ‘Mordy Yallock’ in 1844. The name is thought to be derived from Aboriginal words meaning (1) creek named Moodi or Marida or (2) meaning ‘near little sea’ or ‘small tidal stream’. The Mordialloc Creek is both tidal and of more than usual width where it enters the bay. In the nineteenth century a sandbar often made the creek mouth a shallow inlet. The builder of the Epsom Racecourse also owned the adjoining Mayfield estate on which the Mordialloc (later Woodlands) golf course was formed in 1913. 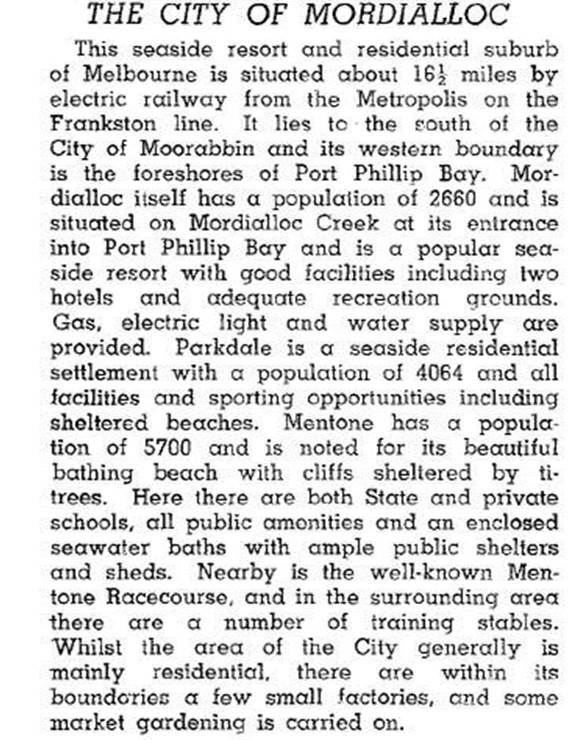 On 26 May 1920, the Mentone and Mordialloc borough was created by severance from the Moorabbin shire, the borough having a population of about 5700 persons. It became Mordialloc town on 24 April 1923 and a city on 5 May 1926. The municipality included a small part of Beaumaris in the west and ended at Mordialloc Creek, an area of 13.6 sq km. Mordialloc suburb at the southern end of the municipality, on the Mordialloc Creek, has foreshore and watercourse reserves, along with others adjoining the former Epsom Training Track. The training track closed in 1998 and the land turned over to new housing in the early 2000s. The shopping centre is between the foreshore and the railway station. It comprises the Main Street shopping strip and a drive-in plaza of 11 shops including a supermarket (1985). The State primary school and the Catholic primary school (1911) are within walking distance of the shops. The beach remains popular with lifesaving and picnic facilities. The pier and the Mordialloc Sailing Club are near the mouth of the Mordialloc Creek. Mordialloc Creek is a distributary waterway, branching from the Dandenong Creek in Bangholme. Before the digging of the Patterson River drain in 1879 Its waters came from the Carrum Swamp. It was regularly flushed and was popular for swimming, boating and fishing. The Mordialloc Motor Yacht Club (1925) and the Sea Scouts and Guides have club rooms near Beach Road. Jack Pompei’s boat yard is a few hundred metres upstream. Bad floods in 1934 brought about an artificial blockage of the creek, causing silting and pollution, and only the tidal entrance had acceptable water quality. The creek was dredged in 2012. Mordialloc's early housing is mainly modest brick veneer, with bigger houses along Beach Road overlooking the beach and the bay. Over 400 dwellings were built during 2001-06, mostly on the former Epsom Training Track. Two hundred were flats and apartments. At the 2011 census, a little over half of Mordialloc’s dwellings were row houses, flats and units.